The call up of regiments for the Canadian army during the Second World War was not a random hodge podge exercise. Mobilization was based upon the structure and needs of the proposed Canadian field army. Innovations and the changing methods of war led to new tactics and demands for different types of units. The British army formed the Reconnaissance Corps in 1941, tasked with using light armoured vehicles to provide intelligence and screening for large formation operations. Canada, operating with orders-of-battle and war establishments similar to British, followed suit, and mobilized or converted regiments to perform the same roles in Canadian formations. Initially, the 18th (Manitoba) Reconnaissance Battalion was detailed as the reconnaissance regiment for 4 Canadian Armoured Division. While the role and nomenclature of the unit was evolving, the identity and cohesiveness of the new regiment needed to be addressed. As a composite unit, the officers and other ranks wore a combination of badges reflecting their original militia units. Cap badges for the three units were commonly seen during training, a factor working against a new regimental homogeneity. In December of 1941, designs for cap and collar badges for the 18th Recce had been submitted to NDHQ and forwarded to Col. E.L.M. Burns, Officer Administering the Canadian Armoured Corps overseas. [ii] Policy decisions for the badging and insignia of the Canadian Armoured Corps were being made at the same time, and it was advised that the insignia provisions for the 18th be deferred until those matters were settled. On January 26, 1942, the unit was re-designated the 18th (Manitoba) Armoured Car Regiment. [iii] Meanwhile, the design sat in files, awaiting action. The approved cap badge of the 18th Manitoba Armoured Car Regiment. It was to measure 1 7/8 inches high by 2 ¼ inches wide. LAC RG 24 Vol 2266 File HQ 54-28-1043-2. With the design approved, cost quotations were requested, and estimates were submitted by Scully, Gaunt and Cote Engravers in early July. Procuring insignia required approval of the Inspection Board of the United Kingdom and Canada (IB), and with their approval, steps were taken to acquire the badges. On July 14, NDHQ replied that the funds to produce dies and 1,000 sets of badges by one of these makers were available. On August 12, the 18th (Manitoba) Armoured Car Regiment was ordered to proceed overseas. The unit embarked on August 19 without an issue of new cap badges. Overseas, the matter came to the attention of the GOC 4 Canadian Armoured Division, and a message requesting that 1500 cap badges be despatched by bomber mail, as soon as available, was wired to Canada. The badges were not available, and it appears the procurement had been forgotten with the unit’s move to the United Kingdom. 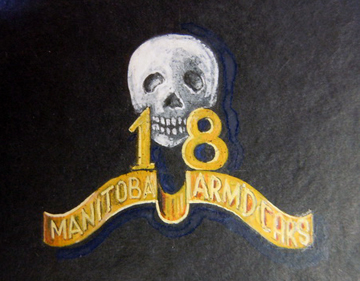 The approved collar badge for the 18th Manitoba Armoured Car Regiment. LAC RG 24 Vol 2266 File HQ 54-28-1043-2. 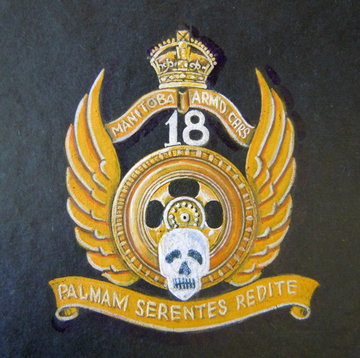 Button drawing for the 18th Armoured Car Regiment. It is not consistent with the description submitted for the design. DHH. I saw a cable going through regarding badges for 18 Armd Car Regt, 4 Cdn Div. Apparently they had never been supplied …and have now been advised that the work on the badges has not yet started. I saw the design of the badge and it is a very poor one. The reconstituted unit wishes to get out a good design and have it made in this country of plastic. 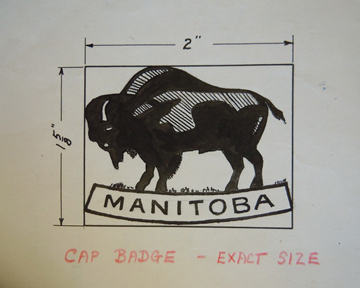 The design is a plain buffalo and is an excellent one which will associate the unit with Manitoba. I wish you personally, when you are in Canada, would deal with this and while you are away that the A.D. Q.M.G. would follow this up and facilitate in every way the obtaining of the new plastic badge, referring to me at any time if there is any delay. At present there are at least a dozen different badges used by the officers and this is very undesirable. Montague’s sponsored design was a North American bison, standing on the prairie, over a simple banner reading MANITOBA. It bore a striking resemblance to the 12th Manitoba Dragoons badge, the badge worn earlier in the career of the Senior Officer, CMHQ. The CO of the 18th Armoured Car Regiment embraced Montague’s badge, but complications arose. The GOC First Canadian Army weighed in on the discussion indicating “I see no objection to the Buffalo of the 12 Man Dns provided there is a “difference”, this could be accomplished by a completely different patterned riband (scroll).” Next the debate spanned the Atlantic Ocean, and Col. Fortesque Duguid, Director of Historical Services at NDHQ, replied that “the rights of a unit to its authorized badges and buttons should be respected.”[v] This debate over the badge for the 18th Manitoba Armoured Car Regiment further slowed acquisition of the regiment’s insignia. The cap badge design as proposed by Maj. Gen. J.P.Montague. Note: the scale of this drawing is not to exact size. LAC RG 24 Vol 2266 File HQ 54-28-1043-2. Designs of badge for 18 Armoured Car Regiment conveyed by DQMG resembles too closely badges of 12 Manitoba Dragoons still being worn by Reserve unit therefore cannot be authorized as a new badge for 12 A C R. …Suggested as an alternative that unit adopt 12 Manitoba Dragoons badges entirely and apply for change in subsidiary title otherwise new design will be required…Reply cable action proposed and state approximate average costs of moulds for plastic badges. Maj. Gen. Montague may have lost the badge design battle, but he had won an active service designation for his former unit, where he had served as a junior officer. Shortly after the re-designation the unit acquired the 12th Manitoba Dragoons cap badge. On January 12, 1943, the 12th Manitoba Dragoons were designated the reconnaissance regiment for 2 Canadian Corps, and transferred to that formation. The 12th Manitoba Dragoons would serve as the 2 Canadian Corps armoured car regiment during the campaign in northwest Europe, wearing the cap badge of that proud prairie regiment. 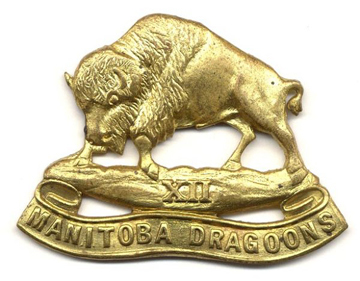 22th Manitoba Dragoons brass other ranks cap badge as adopted by the 18th Manitoba Armoured Car Regiment. Image courtesy of Dwayne Hordij. [i] Tascona B, XII Manitoba Dragoons: A Tribute, Manitoba Dragoons History Book Committee, 1991. P71-72, and Tonner M. On Active Service, CD ROM, Service Publications, Ottawa. [ii] The protocol for insignia approval at this time required that units serving overseas have their badges approved through CMHQ. It was desired that the badges be consistent with the system for the Canadian Army (Overeas). As the 18th Recce was to serve overseas, they referred the approval to overseas authority. [iii] Historical Section, Canadian Military Headquarters, Report No 168, The Organization of First Canadian Army, 1946, and Tascona, ibid. Various correspondence, dated December 1941 and July 1942. Record Group 24, Volume 2266, File HQ 54-28-1043-2. [iv] G.O. 313 1942. Part “A” General Orders 1942. LAC RG 24 Vol 2266 File HQ 54-28-1043-2. [v] Messages and correspondence from File 13/18 ACR/1. September 1942. LAC RG 24 Vol 2266 File HQ 45-28-1043-2., and Tascona, ibid, p83-85. [vi] Messages and correspondence from File 13/18 ACR/1. September 1942. LAC RG 24 Vol 2266 File HQ 45-28-1043-2.